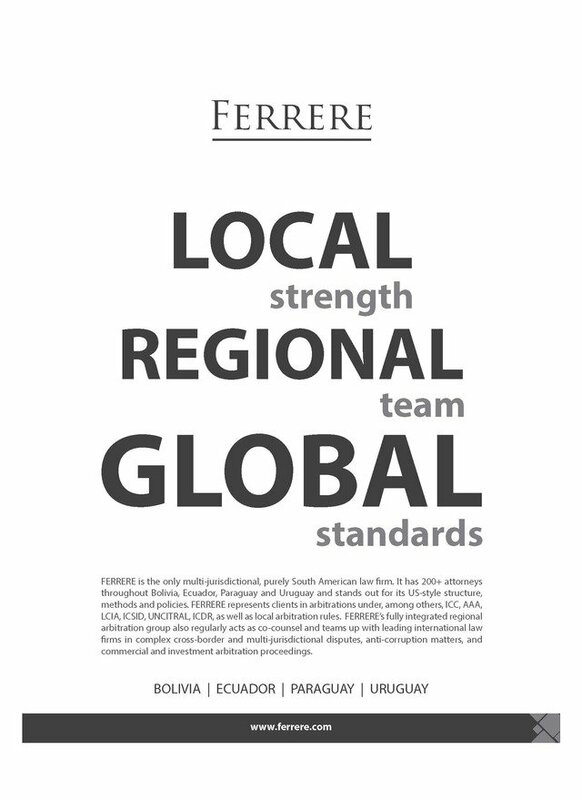 Ferrere is the largest law firm in Uruguay and the only South American firm to have pursued cross-border expansion without the backing of a foreign firm, setting up offices in Bolivia, Paraguay and Ecuador. The firm began to cooperate with US and UK firms on cross-border disputes in the late 1990s, and set up a dedicated dispute resolution department around that time, headed by construction partner Julio Iribarne. The collapse of some large private banks in Uruguay in 2002 meant the firm soon found itself co-counselling with arbitration teams at Allen & Overy, Shearman & Sterling and Arnold & Porter. It represented JPMorgan Chase, Credit Suisse, Commerzbank and Dresdner Lateinamerika in two ICC cases against the Uruguayan government worth more than US$1 billion – and its success in those cases helped the arbitration group grow. The practice received a boost in 2015 when it founded a new office in Quito staffed by a team from Ecuadorean firm Paz Horowitz. The Quito team includes Javier Robalino, who now co-chairs the arbitration practice with disputes head Sandra González in Montevideo. Other names to know are Agustin Mayer West, managing partner of Ferrere's Uruguay office; and Andrés Donoso, a former member of Ecuador’s hydrocarbons ministry. Besides five offices in Uruguay, the firm has bases in Cochabamba, Santa Cruz and La Paz (Bolivia); Quito, Manta and Guayaquil (Ecuador); and Asunción (Paraguay). Clients that have used Ferrere include ConocoPhillips, Schlumberger, Hyundai Engineering & Construction, Petrobras, and Austrian technology group Andritz. It has worked for private equity groups such as Elliott & Associates, Bluecrest Capital Management and Chile’s Linzor Capital (see “Recent events”). It’s also reported to have advised a national oil and gas operator YPF in Uruguayan court proceedings related to a US$1.4 billion ICC dispute over gas exports. The firm helped ConocoPhillips settle a nine-year fight with Ecuador over the expropriation of two oil blocks, with the state agreeing to pay US$337 million in late 2017 to satisfy an ICSID award. In the arbitration, Conoco also saw off most of a groundbreaking US$2 billion counterclaim advanced by Ecuador for alleged environmental damage to the Amazon rainforest (the state was awarded just US$40 million.) Three Crowns, Freshfields and King & Spalding were co-counsel to Conoco in the case. In 2015, the firm helped Austrian technology group Andritz secure a €40 million payment to settle a claim against the Finnish-Chilean owners of Uruguay’s largest pulp mill project, Montes del Plata. It partnered with WilmerHale on the case. A co-counsel pairing with White & Case saw the firm help Indian steel company Jindal secure a U$22.5 million award against a Bolivian state mining company. Jindal is currently seeking confirmation of the award in a court in Washington, DC, after it was set aside by a court in Bolivia. The parties have also entered settlement talks – thereby pausing a second arbitration worth US$100 million relating to the same iron ore project, in which Ferrere was again counsel to Jindal. Ferrere continues to advise Bahamian entity Perenco (Conoco’s partner in the disputed oil blocks) in a parallel ICSID case in which Ecuador has lodged an environmental counterclaim worth US$2.5 billion. Debevoise & Plimpton is co-counsel on that case, which is awaiting a final award. The firm is also acting for international commodities company Glencore in a US$680 million UNCITRAL arbitration against the Bolivian government over the alleged illegal appropriation of assets including mining facilities and rights. Ferrere and Latham and Watkins are acting for Chilean investor Linzor Capital Partners in ICSID proceedings against the Uruguayan government, which placed a cap on the number of pharmacies that can be owned by a single investor in the country shortly after Linzor acquired Uruguay’s Farmashop in 2013. The firm is pursuing a further action against the state on behalf of Panama-registered Latin American Regional Aviation Holding, which has accused Uruguay of illegally expropriating former national airline Pluna Líneas Aéreas Uruguayas. It is also acting for mining company Minera Aratiri in a US$3.5 billion investment treaty claim against Uruguay relating to a mining concession. The firm is working alongside King & Spalding on behalf of Zamin Ferrous, a Jersey mining company owned by Indian magnate Pramod Agarwal, in a potential investment treaty claim against Uruguay over an iron ore project. Another instruction came from gas distribution subsidiaries of Brazil’s national oil and gas company Petrobras in a pair of arbitrations against Uruguay. The dispute concerns the rising costs of importing gas from Argentina. FERRERE advises and represents domestic and foreign clients in local and international commercial and investment arbitrations, in multi-jurisdictional disputes and under international law. It has proven experience in handling complex and economically and institutionally highly sensitive cases, including specifically cases against governments. The FERRERE Arbitration team consists of attorneys who have practiced in this field for several decades. Many of them have studied and worked abroad. FERRERE is in a position to put together the team best suited to the needs of each case and client, combining the technical knowledge required by the case and experience in handling arbitration. The group is consistently recognized as one of the most relevant in Latin America, a reputation gained by innovative strategies, meticulous preparation, creative lawyering and the determination to constantly surpass clients’ expectations. Thanks to the experience and size of the arbitration group and the firm’s other practice areas, FERRERE is capable of putting together the team that best suits the needs of each case and each client, combining the technical knowledge the case requires with experience in handling arbitrations.